There are, roughly speaking, two distinct types of Scottish Fairy Tales. There are what may be called “Celtic Stories,” which were handed down for centuries by word of mouth by professional story-tellers, who went about from clachan to clachan in the “Highlands and Islands,” earning a night’s shelter by giving a night’s entertainment, and which have now been collected and classified for us by Campbell of Isla and others. These stories, which are also common to the North of Ireland, are wild and fantastic, and very often somewhat monotonous, and their themes are strangely alike. They almost always tell of some hero or heroine who sets out on some dangerous quest, and who is met by giants, generally three in number, who appear one after the other; with whom they hold quaint dialogues, and whom eventually they slay. Most of them are fairly long, and although they have a peculiar fascination of their own, they are quite distinct from the ordinary Fairy Tale. These latter, in Scotland, have also a character of their own, for there is no country where the existence of Spirits and Goblins has been so implicitly believed in up to a comparatively recent date. Perhaps it was the bleak and stern character of their climate, and the austerity of their religious beliefs which made our Scottish forefathers think of the spirits in whom they so firmly believed, as being, for the most part, mischievous and malevolent. Their Bogies, their Witches, their Kelpies, even their Fairy Queen herself, were supposed to be in league with the Evil One, and to be compelled, as Thomas of Ercildoune was near finding out to his cost, to pay a “Tiend to Hell” every seven years; so it was not to be wondered at, that these uncanny beings were dreaded and feared. But along with this dark and gloomy view, we find touches of delicate playfulness and brightness. The Fairy Queen might be in league with Satan, but her subjects were not all bound by the same law, and many charming tales are told of the “sith” or silent folk, who were always spoken of with respect, in case they might be within earshot, who made their dwellings under some rocky knowe, and who came out and danced on the dewy sward at midnight. Akin to them are the tales which are told about a mysterious region under the sea, “far below the abode of fishes,” where a strange race of beings lived, who, in their own land closely resembled human beings, and were of such surpassing beauty that they charmed the hearts of all who looked on them. They were spoken ef as Mermaids and Mermen, and as their lungs were not adapted for breathing under water, they had the extraordinary power of entering into the skin of some fish or sea animal, and in this way passing from their own abode to our upper world, where they held converse with mortal men, and, as often as not, tried to lure them to destruction. The popular idea always represents Merfolk as wearing the tails of fishes; in Scottish Folklore they are quite as often found in the form of seals. Then we frequently come across the Brownie, that strange, kindly, lovable creature, with its shaggy, unkempt appearance, half man, half beast, who was said to be the ordained helper of man in the drudgery entailed by sin, and was therefore forbidden to receive wages; who always worked when no one was looking, and who disappeared if any notice were taken of him. 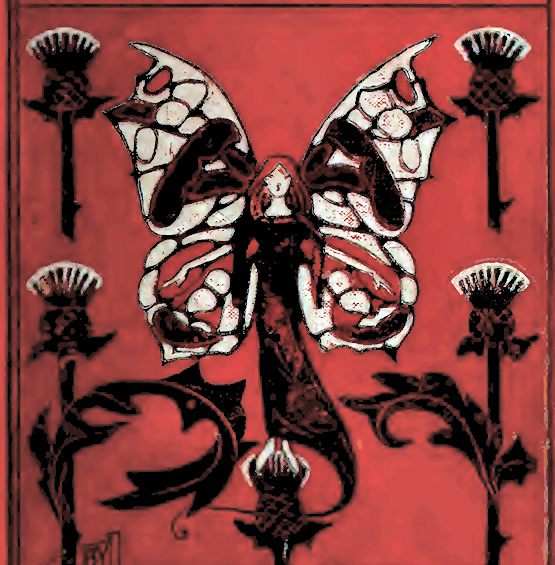 In preparing this book I have tried to make a representative collection from these different classes of Scottish Folklore, taking, when possible, the stories which are least well known, in the hope that some of them, at least, may be new to the children of this generation. It may interest some of these children to know that when James IV was a little boy, nearly four hundred years ago, he used to sit on his tutor, Sir David Lindsay’s, knee, and listen to some of the same stories that are written here :—to the story of Thomas the Rhymer, of the Red-Etin, and of The Black Bull of Norroway. Although in every case I have told the tale in my own words, I am indebted for the originals to Campbell’s “Popular Tales of the Western Highlands,” Leyden’s Poems, Hogg’s Poems, Scott’s “Border Minstrelsy,” Chambers’ “Popular Rhymes of Scotland,” “The Folklore Journal,” etc.